The 12 soccer players and their coach who were rescued from a flooded cave in Thailand made their first public appearance Wednesday, smiling and waving and sharing details of their frightening ordeal. Ekapol Chanthawong, the 25-year-old coach who led the boys into the Tham Luang Nang Non cave, immediately wanted to set the record straight. "Yes, we all can swim," he said, correcting government officials who had told reporters most of them could not swim. The boys were each given a soccer ball when they entered a hall in Chiang Rai for Wednesday's press conference. Before speaking they kicked the balls around in front of a stage to show they were all healthy. Some of the 12 members of the Wild Boar soccer team, who were rescued from the Tham Luang cave, greet the media at Chiang Rai Provincial Administrative Organization in Chiang Rai province, Thailand, July 18, 2018. One of the boys called it a "miracle" when two British divers discovered them. "Then he asked, 'How are you' and I responded, 'We're fine,'" Pipat "Nick" Pho, 15, said. The boys said they had no food with them when they went into the cave on June 23 and had initially decided to spend just an hour underground. But when they went to leave, they found their exit path flooded after monsoon rains hit. Two of the twelve rescued members of the Wild Boar soccer team depart from the Chiangrai Prachanukroh Hospital in Chiang Rai province, Thailand, July 18, 2018. Chanthawong said they made the decision together to go deeper into the cave, believing there was another way out. He said they were immediately confronted by sections of deep water they had to swim through. "The water went up to my shoulder. So everyone followed me," Chanthawong said. As the floodwater rose, one of the boys asked if they were lost. But Chanthawong said he assured the group that they weren't. "There's only one direction in the cave," he said. As the hours passed, Chanthawong said he tried to keep the boys calm, telling them "to fight and not be defeated." Twelve Thai boys and their football coach, rescued from a flooded cave after being trapped, attend a press conference in Chiang Rai, July 18, 2018, following their discharge from the hospital. The group found an area about 650 feet up a rock and decided to stay there for the night. Before they went to sleep, they prayed, the boys said. "I didn’t worry at that time because I thought the water would lower down overnight and we could get out," Chanthawong said. They had no food or water, so the next day they went hunting for fresh water to drink, finding some trickling down a wall in the cave. "I felt weak and very hungry," said the youngest boy, 11-year-old Chanin Vibulrungruang. "I drank water to make me full." As hours stretched into days, the boys said they would take turns digging into the cave walls, believing they could tunnel their way out. "I would dig on the cave walls," Chanin said. "I could dig three to four meters with rocks to find a way out." Coach Chanthawong said he eventually told the boys to stop digging and to move as little as possible to conserve their energy. Then on the tenth day, trapped in the labyrinth maze, they heard someone speaking in English. Chanthawong instructed one of the boys who had a torch to go investigate. He found the British divers who had been stringing a safety line through the cave as part of the massive search-and-rescue mission. Asked if they would ever return to the cave, all of the boys said, "No." "If someone invites me, I would say no," Chanthawong said. "I would only join them from in front of the cave as a guide to other people." The Wild Boars, as the team is called, also expressed condolences to the family of Lt. Col. Saman Gunan, the retired Thai Navy SEAL who died during the rescue mission. They showed a framed drawing of Gunan that they all signed and plan to send it to his family. "I would like to express our condolences and hope you rest in peace," Chanin, the youngest boy, said, reading the message he wrote on the drawing to Gunan. "Thank you very much for your sacrifice and I felt sorry for Lt. Col. Gunan's family." Some of the rescued soccer team members eat a meal together at a hospital in Chiang Rai, northern Thailand, July 15, 2018. Coach Chanthawong said that when they heard of Gunan's death, "Everyone was shocked. Everyone was saddened by the news and we felt guilty that we were the cause of his death." Officials released the team from Chiangrai Prachanukroh Hospital at about 5 p.m. Wednesday local time. Before they left the hospital, nurses, doctors and staff formed a human tunnel in which the coach and boys walked through, hugging and bowing to those who treated them since they were rescued. A video of the goodbye event was played at the press conference. Most of the boys said they'd like to become both professional soccer players and Navy SEALs when they grow up. As the boys spoke the three Thai Navy SEALS and the doctor who stayed with them in the cave sat nearby. The boys said the biggest lesson they learned from the ordeal is to be more careful. "This experience taught me not to live life carelessly," said Pipat Pho. Following the press conference, the boys finally went home. As soon as young Chanin got to his house, his sister and relatives swarmed him, hugging and kissing him. ABC News crews were present to witness most of the homecoming reunions with loved ones. Chanin changed into the clothes he wore while trapped in the cave and went with his family to a local temple, where he removed the clothes and left them at an altar to cleanse them of bad spirits, relatives told ABC News. 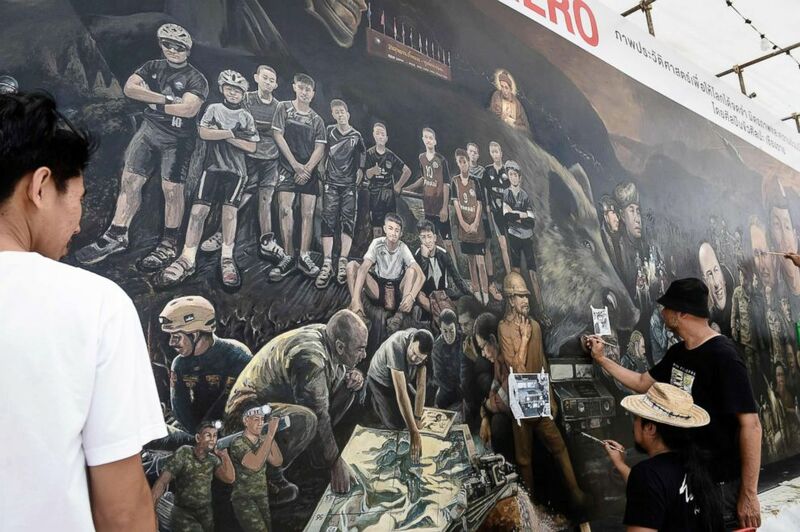 Local artists work on a mural dedicated to the successful rescue of the 'Wild Boars" football team outside an art gallery in Chiang Rai province, July 18, 2018, as family members await for the children's homecoming. 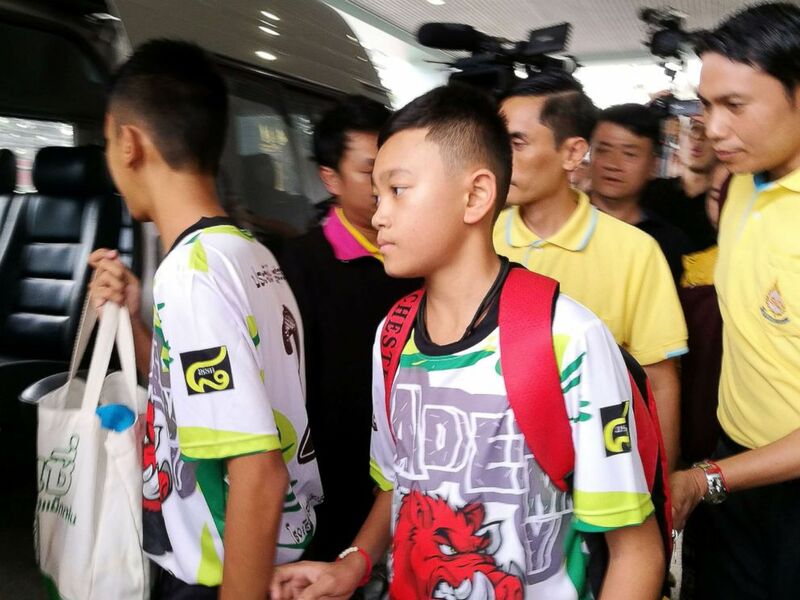 Another boy, Ekarat "Bew" Wongsukchan, 14, was greeted by an aunt and his grandparents when he arrived home with his parents. His grandmother cried as she embraced him, and the whole family held a blessing ceremony that included water and soap pod leaves as holy water. Duganpet Promtep, 13, posed for photos with his relieved father and grandfather when he arrived at his family's store in Mae Sai. Also there was a greeting party of relatives and neighbors who showered him with affection. Their rescue took place over a period of three days last week. The first four boys were taken out of the cave on July 8 in a tandem rescue effort, with one SEAL swimming ahead of the boys and another behind, all the while attached to a tether. Four more boys were rescued the following day, July 9, and the final four boys and their coach were brought out of the cave on July 10. The final group had stayed in the cave for 18 days by the time they were saved. Former provincial Gov. Narongsak Osatanakorn told ABC News that as soon as the final boys and coach were taken out of the cave, the main water pump failed and water rushed back into the tunnel. The Navy SEALs still inside were forced to abandon oxygen tanks and quickly make an escape. For having spent over two weeks underground, the boys were in remarkable health from the moment they were rushed to the hospital. Relatives of Duangpetch Promthep, one of the boys rescued from the flooded cave in northern Thailand, greet him as he arrives home in the Mae Sai district, Chiang Rai province, northern Thailand, July 18, 2018. A few of the boys tested positive for minor lung infections, but on the whole, officials said from the beginning the boys were happy and healthy. As a precaution, they were not allowed to eat solid foods, or spicy foods, for their first days in the hospital. Their parents were also forced to view them from afar, and through glass, for two days in order to prevent the spread of infection. "Their physical strength has returned," said Lt. Col. Pa Lo han Chu, one of the military doctors who treated the boys. "They're looking forward to eating a delicious meal. There is nothing to worry about."